Meringue: a dessert made from whipped egg whites and sugar. How hard does that sound?? Meringue is a scary dessert to make, I don’t have a lot of confidence in my meringue making skills. I mean, the only time I’ve attempted meringue was a few years ago. Myself and two of my lovely cousins, Rachel and Leah, made banoffee cupcakes. 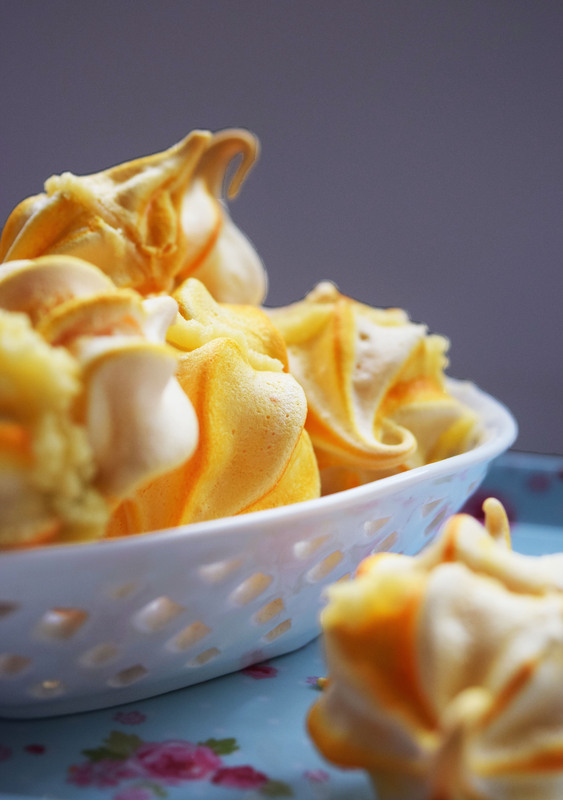 The recipe needed to use egg yolks, so instead of throwing the egg whites away, we decided to make mini meringues. However, they didn’t turn out quite the way we hoped. Since then, I hadn’t touched any meringue recipes until now. 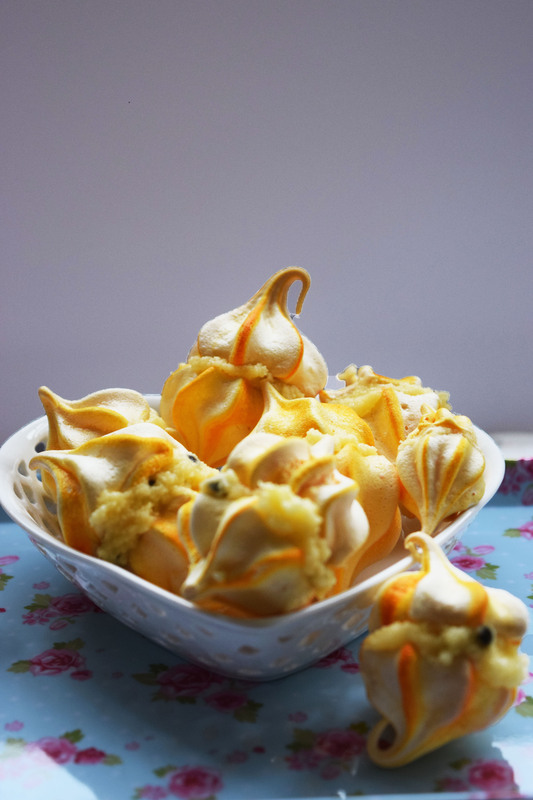 As I looked at one of my recipe books I stumbled upon these passionfruit meringue kisses, I toyed with the idea of making meringues again. I remembered that the attempted meringue was just a last minute spontaneous thing and if I did my research and spent some time I should be able to successfully create these treats. So I did my research and found some tips to follow. Use metal or glass bowls. Plastic can retain grease, which inhibits the egg whites voluminous foam that is desired. The equipment must be cleaned and free from fat and grease. So the bowl and whisk attachment were rubbed cleaned with white vinegar. Another source suggested half a lemon, which I probably would have chosen over vinegar (if I had a lemon available) due to the more ‘refreshing’ scent. If a speck of egg yolk gets into the whites, start again. A top tip is to separate the eggs into smaller bowls one at a time and then add the whites individually into the mixing bowl. Therefore, if you get yolk into the whites, you only need to discard the one egg instead of starting all over again. Whisk the egg whites when they are at room temperature. Gradually add the sugar to the soft peak stage of the egg whites. Whisk the mixture, until the consistency is smooth and you cannot feel the sugar when you rub a small amount of the meringue between your thumb and finger. Also use caster sugar, the grains are finer and will dissolve easily. The meringues need to bake in the oven at a low temperature for a long time. Once done, keep the meringues in the oven and turn the oven off so the meringues can dry out. Well, I followed these tips, and although the first half of the batch were slightly burnt, I decided to turn the oven temperature down a bit more and the second half of the batch turned out extremely well. I also painted the inside of the icing bag with lines of yellow food colouring to create the two toned coloured meringue. So with all this meringue information, my meringue game has stepped up to a new level and I hope you’ll be seeing more meringue blogs in the future. But for now, enjoy the pictures! Previous Post Why choose Fairtrade?